Posts may contain affiliate links (products or services that pay a commission if purchased through the link). Birthdays feel a lot different as I get older. It’s just another day, really. Not because I’m depressed about aging or anything, but the celebratory nature of it just isn’t there. I wish I was one of those people who could make everything a party. Every holiday, every birthday, every accomplishment and milestone becomes something to celebrate to people like that, and I admire them. To me, these are distractions that only add to my mental load. I have to force myself to slow down and appreciate moments, or else I’ll barrel on ahead without a second glance. Much like my birthday this past week. I’m 32 years old now. The milestone gets my brain going. It’s something of an existential crisis honestly, but not to a depressing level. I’ve already muddled my way through some depression, and now I’m just kind of thoughtful. When I was 17 and 18 years old, I thought I had life figured out. Didn’t we all? I knew what I was going to be: a business owner. I knew I would be married, and I wanted three children. Check, check, and check. Yet here I am at 32 years old, and everything is different. Not in a bad way, but life isn’t what I expected. Duh. For most of my twenties, I had a clear plan and vision. My (ex) husband and I owned a business together. We had plans. Hit this milestone, then that milestone. Pay off this debt, then that debt. Travel here. Now travel there. And then…then what? Then, apparently, squander everything in a hedonistic whirlwind. I’m a little older and, I think, a little wiser now. I’m sober, and I know how easy it can be to fall into destructive patterns of thinking and acting. Now, I’m careful. Maybe too careful at times, and not careful enough at others, but careful nonetheless. Far more than I was 5 or 10 years ago. 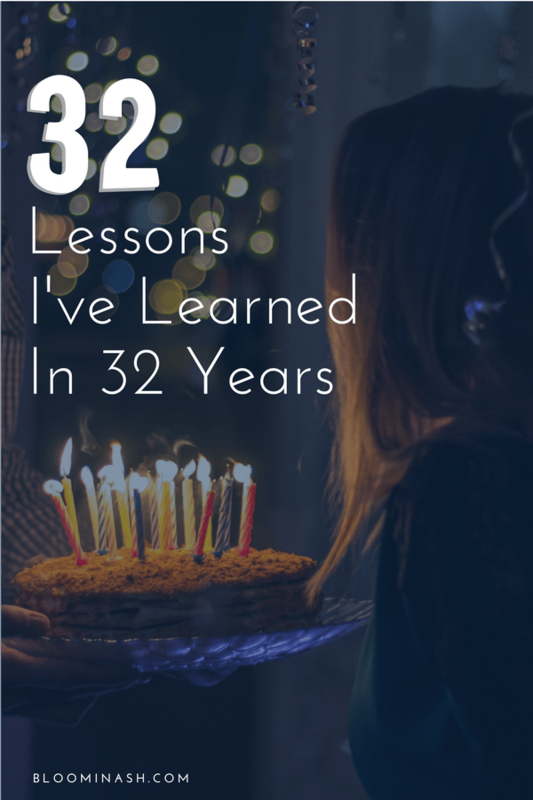 32 isn’t a nice round number, but it feels significant to me. Real, somehow. I’ve learned a lot, and I think I’ll make a list. Lists are always nice. This is by no means a comprehensive list of all the things I’ve learned, but it’s a start. Expectations are often nothing more than future resentments. Keep your standards, discard your expectations. You cannot have a healthy relationship without healthy boundaries. There is freedom in being responsible for yourself. If you screwed something up, you get to fix it. People who need to be needed don’t let go easily once you find your wings. Be wary of “saviors”, even if it’s yourself. Especially if it’s yourself. Codependency is not the same thing as love and true help. You don’t need drugs or alcohol to have a good conversation with the right kind of people. You don’t need drugs or alcohol to feel beautiful. You don’t need drugs or alcohol to attract anybody. You don’t need drugs or alcohol to relax. You don’t need drugs or alcohol to get through life. Anybody who says they prefer you intoxicated over sober needs to exit, stage left. Life is a lot calmer when it’s lived in the moment, one day at a time. Don’t make assumptions. Speak what you want, express what you’re thinking, and listen to what somebody says and does rather than assume their motives and intentions. We will all fall at some point, in some way, either visibly or invisibly. Avoid hero worship. Life is freaking hard sometimes. Seriously. Try not to make it harder with bad decisions, but if you do: learn and move on. Don’t wait around for the world to give you what you want. It doesn’t work like that. Go after it. Even if it feels like you’ve lost everything, you can survive it and you will be a better person for it. Feelings aren’t facts. Don’t ignore your feelings, but don’t worship them either. Speak clearly and confidently. Avoid passive language that’s always asking for permission in some way. Make eye contact with people you encounter throughout the day. Smile. Let them know with your body language that you see them. Make an effort to remember people’s names. It’s ok to let other people be wrong sometimes, in some situations. Choose your battles wisely. Get rid of the clutter. It’s easier to think and be at peace in a clean area. Surrender is sweet, and God is there when you call. You will become like the people you associate with the most. Choose them wisely. Make sure they inspire you to be better, rather than drag you down or keep you down. Stay curious. There is always more to learn. Gratitude will give you life. Create a daily practice, even if it’s just thinking through a few things every day. Keep reading. Keep writing. Keep singing, and dancing, and picking dandelions to make a wish. Honor your word, always. Be honest and reliable in all things. Waking up early and making your bed first thing in the morning feels freaking awesome when you’re an adult. Waking up clear-minded and sober on a Saturday or Sunday morning feels like a high on its own sometimes. Don’t work harder for somebody else than they’re willing to work for themselves. There are exceptions to this, but it’s a solid rule of thumb. If something isn’t working for you, and you’ve given it enough time, make a change.